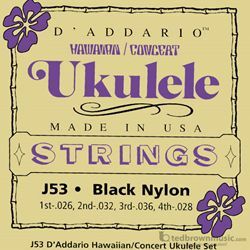 D'Addario J53 sets are designed for use with Hawaiian Concert ukuleles. Each string within this set is made from our warmest sounding black nylon. This set is optimized for usage with standard GCEA tuning. D’Addario ukulele sets are available in a wide variety of gauges for all popular ukulele instrument sizes and tunings. Each set is made from the finest quality nylon, aluminum and silver-plated copper materials ensuring optimal tone and absolutely perfect intonation, set after set.